Our range of products include emergency and recovery trolley, ss stretcher deluxe, stretcher deluxe ms, stretcher ss, stretcher on trolley ss top and stretcher on trolley ms.
We provide clients with the premium quality of Emergency and Recovery Trolley. 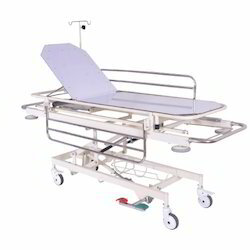 The dimension of emergency and recovery trolley is 2050 mm length x 710 mm width. Height adjustable of the emergency and recovery trolley, by hydraulic foot pump from 650 mm to 880 mm. 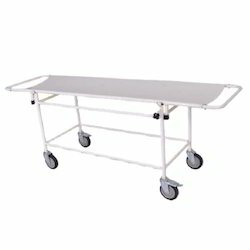 Two section of emergency and recovery trolley with the x ray permeable removable top. Motivated to attain maximum client approval, we provide clients with the premium quality of Stretcher Deluxe SS. Overall dimension of the stretcher deluxe SS is 1970 mm length x 670 mm width X 810 mm height. 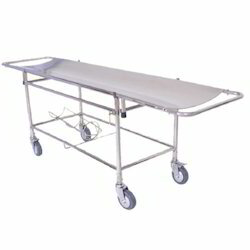 Stretcher deluxe is constructed by using latest machinery and high grade stainless steel. 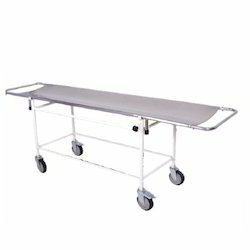 The stretcher deluxe stainless steel is provided with backrest movement on ratchet. 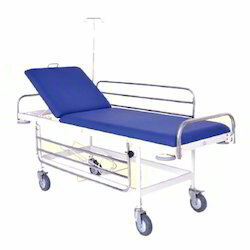 Owing to our rich experience of this domain, we provide clients with the premium quality of Stretcher Deluxe MS. Made from mild steel, the stretcher deluxe mild steel is known for dimension for 2050 mm length and 560 mm width. The removable stretcher top is provided with the stretcher, with four 150 mm wheel two with lock for easy transportation. We provide clients with the premium quality of Stretcher SS. Known for its foldable handle and buffer on all the corner, the stretcher is manufactured by using high grade steel. 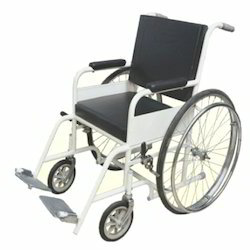 Four 150 mm wheel two with lock is provided with the stretcher for easy movement. Dimension of the stretcher is 1970 mm length x 670 mm width X 810 mm height.